41 The Villas’ formal entry foyers, floor-to-ceiling windows and seamless transition to indoor and outdoor spaces emphasize the expansive desert and mountain views six, two- and three-story buildings and range in size from 1,700 to more than 4,500 square feet. The Villas’ timeless, modern architecture will emphasize clean lines and a comfortable, refined setting. The second residential component will be The Ritz-Carlton Estates Home Residences, which is comprised of 39 single-family homes. 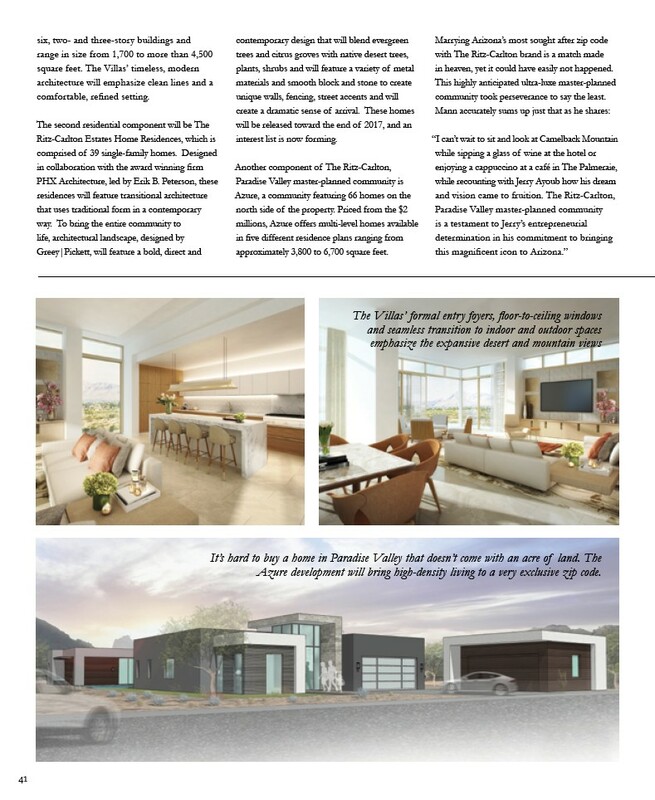 Designed in collaboration with the award winning firm PHX Architecture, led by Erik B. Peterson, these residences will feature transitional architecture that uses traditional form in a contemporary way. To bring the entire community to life, architectural landscape, designed by Greey|Pickett, will feature a bold, direct and contemporary design that will blend evergreen trees and citrus groves with native desert trees, plants, shrubs and will feature a variety of metal materials and smooth block and stone to create unique walls, fencing, street accents and will create a dramatic sense of arrival. These homes will be released toward the end of 2017, and an interest list is now forming. Another component of The Ritz-Carlton, Paradise Valley master-planned community is Azure, a community featuring 66 homes on the north side of the property. Priced from the $2 millions, Azure offers multi-level homes available in five different residence plans ranging from approximately 3,800 to 6,700 square feet. Marrying Arizona’s most sought after zip code with The Ritz-Carlton brand is a match made in heaven, yet it could have easily not happened. This highly anticipated ultra-luxe master-planned community took perseverance to say the least. Mann accurately sums up just that as he shares: “I can’t wait to sit and look at Camelback Mountain while sipping a glass of wine at the hotel or enjoying a cappuccino at a café in The Palmeraie, while recounting with Jerry Ayoub how his dream and vision came to fruition. The Ritz-Carlton, Paradise Valley master-planned community is a testament to Jerry’s entrepreneurial determination in his commitment to bringing this magnificent icon to Arizona.” It’s hard to buy a home in Paradise Valley that doesn’t come with an acre of land. The Azure development will bring high-density living to a very exclusive zip code.